Red Team Engineering believes in advancing the state of the art in our areas of specialization. As a result, we provide a number of resources in the areas of innovation, model based systems engineering (MBSE), software engineering (SE), network engineering and cyber security engineering. 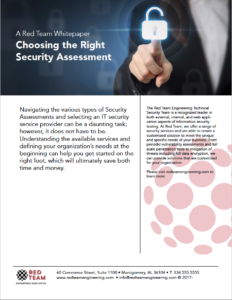 Navigating the various types of Security Assessments and selecting an IT security service provider can be a daunting task; however, it doesn’t have to be. Download this whitepaper to learn more. 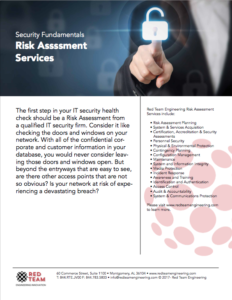 An Information Security Risk Assessment is like checking the doors and windows on your network. With all of the confidential corporate and customer information in your database, you would never consider leaving those doors and windows open. But beyond the entryways that are easy to see, are there other less obvious access points? 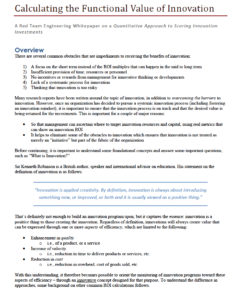 There are several common obstacles that are impediments to receiving the benefits of innovation, including: a focus on the short term instead of the ROI multiples that can happen in the mid to long term; insufficient provision of time, resources or personnel; no incentives or rewards from management for innovative thinking or developments; lack of a systematic process for innovation; and thinking that innovation is too risky.